By the time they are seniors, almost 70 percent of high school students will have tried alcohol, half will have taken an illegal drug, nearly 40 percent will have smoked a cigarette, and more than 20 percent will have used a prescription drug for a nonmedical purpose.1 There are many reasons adolescents use these substances, including the desire for new experiences, an attempt to deal with problems or perform better in school, and simple peer pressure. Adolescents are “biologically wired” to seek new experiences and take risks, as well as to carve out their own identity. Trying drugs may fulfill all of these normal developmental drives, but in an unhealthy way that can have very serious long-term consequences. The brain continues to develop through early adulthood. 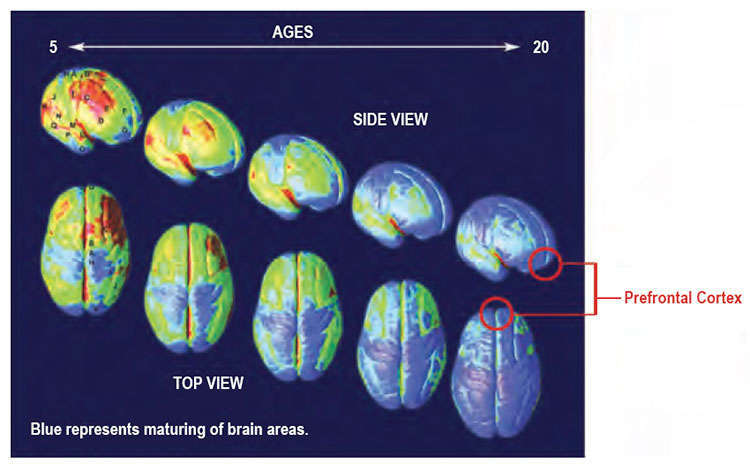 Mature brain regions at each developmental stage are indicated in blue. The prefrontal cortex (red circles), which governs judgment and self-control, is the last part of the brain to mature. The brain is wired to encourage life-sustaining and healthy activities through the release of dopamine. Everyday rewards during adolescence—such as hanging out with friends, listening to music, playing sports, and all the other highly motivating experiences for teenagers—cause the release of this chemical in moderate amounts. This reinforces behaviors that contribute to learning, health, well-being, and the strengthening of social bonds. Adolescents Differ from Adults in Substances Most Abused Source: SAMHSA, Center for Behavioral Health Statistics and Quality, National Survey on Drug Use and Health, 2013. Not all young people are equally at risk for developing an addiction. Various factors including inherited genetic predispositions and adverse experiences in early life make trying drugs and developing a substance use disorder more likely. Exposure to stress (such as emotional or physical abuse) in childhood primes the brain to be sensitive to stress and seek relief from it throughout life; this greatly increases the likelihood of subsequent drug abuse and of starting drug use early.5 In fact, certain traits that put a person at risk for drug use, such as being impulsive or aggressive, manifest well before the first episode of drug use and may be addressed by prevention interventions during childhood.6 By the same token, a range of factors, such as parenting that is nurturing or a healthy school environment, may encourage healthy development and thereby lessen the risk of later drug use. When substance use disorders occur in adolescence, they affect key developmental and social transitions, and they can interfere with normal brain maturation. These potentially lifelong consequences make addressing adolescent drug use an urgent matter. Chronic marijuana use in adolescence, for example, has been shown to lead to a loss of IQ that is not recovered even if the individual quits using in adulthood.11 Impaired memory or thinking ability and other problems caused by drug use can derail a young person’s social and educational development and hold him or her back in life. Adolescents in treatment report abusing different substances than adult patients do. For example, many more people aged 12–17 received treatment for marijuana use than for alcohol use in 2011 (65.5 percent versus 42.9 percent), whereas it was the reverse for adults (see figure). When adolescents do drink alcohol, they are more likely than adults to binge drink (defined as five or more drinks in a row on a single occasion).14 Adolescents are less likely than adults to report withdrawal symptoms when not using a drug, being unable to stop using a drug, or continued use of a drug in spite of physical or mental health problems; but they are more likely than adults to report hiding their substance use, getting complaints from others about their substance use, and continuing to use in spite of fights or legal trouble. Only 10 percent of 12- to 17-year-olds needing substance abuse treatment actually receive any services.16 When they do get treatment, it is often for different reasons than adults. By far, the largest proportion of adolescents who receive treatment are referred by the juvenile justice system (see figure). Given that adolescents with substance use problems often feel they do not need help, engaging young patients in treatment often requires special skills and patience. The focus of this guide is on evidence-based treatment approaches―those that have been scientifically tested and found to be effective in the treatment of adolescent substance abuse. Whether delivered in residential or inpatient settings or offered on an outpatient basis, effective treatments for adolescents primarily consist of some form of behavioral therapy. Addiction medications, while effective and widely prescribed for adults, are not generally approved by the U.S. Food and Drug Administration (FDA) for adolescents. However, preliminary evidence from controlled trials suggest that some medications may assist adolescents in achieving abstinence, so providers may view their young patients’ needs on a case-by-case basis in developing a personalized treatment plan. Whatever a person’s age, treatment is not “one size fits all.” It requires taking into account the needs of the whole person—including his or her developmental stage and cognitive abilities and the influence of family, friends, and others in the person’s life, as well as any additional mental or physical health conditions. Such issues should be addressed at the same time as the substance use treatment. When treating adolescents, clinicians must also be ready and able to manage complications related to their young patients’ confidentiality and their dependence on family members who may or may not be supportive of recovery. Supporting Ongoing Recovery—Sustaining Treatment Gains and Preventing Relapse. When substance use disorders are identified and treated in adolescence—especially if they are mild or moderate—they frequently give way to abstinence from drugs with no further problems. Relapse is a possibility, however, as it is with other chronic diseases like diabetes or asthma. Relapse should not be seen as a sign that treatment failed but as an occasion to engage in additional or different treatment. Averting and detecting relapse involves monitoring by the adolescent, parents, and teachers, as well as follow-up by treatment providers. Although recovery support programs are not a substitute for formal evidence-based treatment, they may help some adolescents maintain a positive and productive drug-free lifestyle that promotes meaningful and beneficial relationships and connections to family, peers, and the community both during treatment and after treatment ends. Whatever services or programs are used, an adolescent’s path to recovery will be strengthened by support from family members, non-drug-using peers, the school, and others in his or her life. * In this guide, the terms drugs and substances are used interchangeably to refer to tobacco, alcohol, illegal drugs, and prescription medications used for nonmedical reasons. ‡ Specifying the period of adolescence is complicated because it may be defined by different variables, and policymakers and researchers may disagree on the exact age boundaries. For purposes of this guide, adolescents are considered to be people between the ages of 12 and 17. # For purposes of this guide, the term addiction refers to compulsive drug seeking and use that persists even in the face of devastating consequences; it may be regarded as equivalent to a severe substance use disorder as defined by the Diagnostic and Statistical Manual of Mental Disorders, Fifth Edition (DSM-5, 2013). The spectrum of substance use disorders in the DSM-5 includes the criteria for the DSM-4 diagnostic categories of abuse and dependence. ** “Treatment providers” in this chart refers to “alcohol/drug abuse care providers.” Treatment providers can and do refer people to treatment if, for example, a person is transferring from one level of treatment to another and the original facility does not provide the level of treatment that the person needs, or if a person changes facilities for some other reason. “Other health care professionals” refers to physicians, psychiatrists, or other licensed health care professionals or general hospitals, psychiatric hospitals, mental health programs, or nursing homes.